How do we approach a services project? Our projects typically involve some form of application development and integration. Join us in these statements of direction and concept. Together, we can provide quality results while still paying attention to cost. 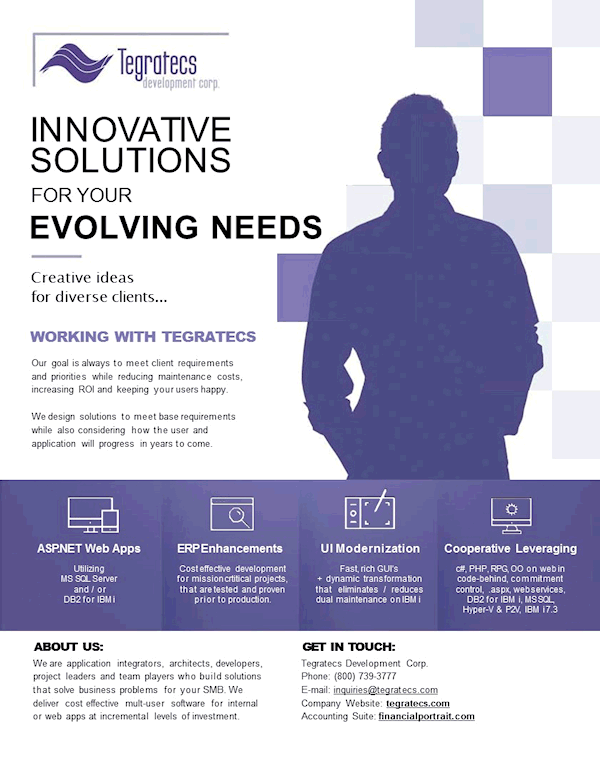 At Tegratecs Development Corp., we provide innovative solutions for the changing needs of your growing business. Our software and consulting services deliver a response today that will last well into the future. Years of experience in online, multi-user, mission critical applications translates into designs that consider the importance of a robust and sturdy foundation. Delivery of designs that handle base functionality along with consideration for how the user and application will evolve is a formula that helps keep user satisfaction high for a longer period, among other benefits. Somewhat rare in the industry, is our offer to expose our techniques to your internal staff. Your company need not be dependent upon us or exposed from a support or system enhancements standpoint. Many outsourced resources and consultants keep technical details to themselves so that the client will continue to be dependent upon them. The client typically doesn't even know what they are missing at first. Virtually all of our clients are self-sufficient to a chosen level and satisfied with the application software and value we have delivered. To provide our clients with high quality business application software that delivers ROI for management. To provide application software that delivers useful tools for end users. To create software solutions that will increase productivity or contribute towards quality improvement or consistency within the company's offerings of products and services. Creation of the best software solution involves communication with end users, use of the latest proven technologies, productivity for the organization and ease of maintenance. One of the key facets in starting a successful project (with custom development) is opening up good communication channels. Solid designs are more important when communication options are reduced. If your company can't find enough time for design today, be careful that any development partners you engage already have experience in the actual application and business speciality areas (and technical configurations). Knowledge transfer can suffer when end user contact is limited if development is done off-shore in the middle of your night. Speed of construction can't make up for requirements definition from within a vacuum. We typically look for opportunities to learn and advance our understanding of the application as we go and to verify that our assumptions are correct. Sometimes business knowledge and technique are hidden in existing software. These hidden assets can be lost when software is being replaced and experienced employees have turned over. Confidence in the lack of ability of an IT precedessor makes for good marketing angles but often backfires when problems solved previously arise again. Communication between members of the various IT disciplines is another area for attention. Information hoarding, internal competition among IT departments and hidden self-interests are problems that hurt a lot of companies and that increase the cost of projects, implementations, maintenance and support. We have expertise in permissions control, database admin and server virtualization in addition to all of the traditional professional application development disciplines. We will be flexible in our selection of resources and take advantage of your company's internal resources as appropriate based on your organization's interests and priorities stated. Some of the key facets in concluding a project successfully are accurate testing and test environment simulation. Environment configuration and test case understanding (a minimum) are especially important with integration projects. Automated data conversion with starting point resets are also quite valuable. The more complex the environment and the solution, the more difficult it is to create meaningful test scenarious. Experience with package implementation gives us an advantage in knowing what to do. Again, gaging whether your project is accurately tested and your upcoming implementation is well planned is hard to achieve if the new system is being developed by a software construction company without access to the idiocyncracies of your environment (your network, server and infrastructure software configurations). Can we leverage your existing investment? If we are selected to provide consulting services at your company, you will get the maximum benefit from your investment. We can help to maximize your technology investments by evaluating the cost/benefit tradeoffs of new software development before construction begins. Considering the Build Versus Buy Equation?